The information, entertainment and cultural pedagogy disseminated by massive multimedia corporations have become central in shaping and influencing every waking moment of children's daily lives - all toward a lifetime of constant, unthinking consumption. "there can be only one kind of value, market value; one kind of success, profit; one kind of existence, commodities; and one kind of social relationship, markets." But corporate-controlled culture not only exploits and distorts the hopes and desires of individuals: it is fundamentally driven toward exploiting public goods for private gain, if it does not also more boldly seek to privatize everything in the public realm. Among US multimedia megacorporations, Disney appears one of the least daunted in attempting to dominate public discourse and undermine the critical and political capacities necessary for the next generation of young people to sustain even the most basic institutions of democracy. The impact of new electronic technologies as teaching machines can be seen in some rather astounding statistics. It is estimated that the average American spends more than six hours a day watching video-based entertainment and, by 2013, the numbers of daily hours spent watching television and videos will match the numbers of hours spent sleeping. "spent in front of a television or video screen is the single biggest chunk of time in the waking life of an American child." Such statistics warrant grave concern, given that the messages provided through such programming are shaped largely by a $263-billion-dollar-a-year US advertising industry, which sells not only its products, but also values, images and identities largely aimed at teaching young people to be consumers. A virtual army of marketers, psychologists and corporate executives are currently engaged in what Susan Linn calls a "hostile takeover of childhood," seeking in the new media environment to take advantage of the growing economic power wielded by children and teens. "$200 billion in spending power." "Children (under 12) and teens influence parental purchases totaling over... $670 billion a year." Because of their value as consumers and their ability to influence spending, young people have become major targets of an advertising and marketing industry that spends over $17 billion a year on shaping children's identities and desires. Exposed to a marketing machinery eager and ready to transform them into full-fledged members of consumer society, children's time is conscripted by a commercial world defined by the Walt Disney Company and a few other corporations, and the amount of time spent in this world is as breathtaking as it is disturbing. Typical children see about "40,000 ads a year on TV alone," and by the time they enter the fourth grade, they will have "memorized 300-400 brands." "exposed to the equivalent of 8½ hours a day of media content... [and that] the typical 8-18 year-old lives in a home with an average of 3.6 CD or tape players, 3.5 TVs, 3.3 radios, 2.0 VCRs/DVD players, 2.1 video game consoles and 1.5 computers." There was a time when a family traveling in a car might entertain itself by singing or playing games. Now, however, many kids have their own laptops or cell phones and many family vehicles come equipped with DVD players. Family members need not look to each other or the outside world for entertainment when a constant stream of media sources is at their fingertips. Today's kids have more money to spend and more electronic toys to play with, but, increasingly, they are left on their own to navigate the virtual and visual worlds created by US media corporations. "consumer-oriented society in the world," Juliet Schor observes that kids and teens have taken center stage as "the epicenter of American consumer culture." The tragic result is that youth now inhabit a cultural landscape in which, increasingly, they can only recognize themselves in terms preferred by the market. Multi-billion-dollar media corporations, with a commanding role over commodity markets as well as support from the highest reaches of government, have become the primary educational and cultural force in shaping, if not hijacking, how youth define their interests, values and relations to others. Given its powerful role among media-driven modes of communication, the Walt Disney Company exercises a highly disproportionate concentration of control over the means of producing, circulating and exchanging information, especially to kids. Once a company that catered primarily to a three- to eight-year-old crowd with its animated films, theme parks and television shows, Disney in the new millennium has been at the forefront of the multimedia conglomerates now aggressively marketing products for infants, toddlers and tweens (kids age eight to twelve). Web sites, video games, computer-generated animation, Disney TV and pop music - developed around franchises like "High School Musical," "Hannah Montana" and the Jonas Brothers, and accessible online with the touch of a button - are now sustaining Disney fans into their teenage and young adult years. Allied with multimedia giant Apple, Inc. (Apple CEO Steve Jobs is the single largest shareholder in Disney) and the cutting-edge animation studio Pixar, Disney is beyond doubt a powerful example of the new corporate media at the beginning of the 21st century. Disney not only represents "one of the best-known symbols of capitalist consumerism," but also claims to offer consumers a stable, known quantity in its brand-name products. Understanding Disney's cultural role is neither a simple nor a trivial task. Like many other megacorporations, it focuses on popular culture and continually expands its products and services to reach every available media platform. What is unique about Disney, however, is its titanium-clad brand image - synonymous with a notion of childhood innocence and wholesome entertainment - that manages to deflect, if not completely trounce, criticism at every turn. As an icon of American culture and middle-class family values, Disney actively appeals to both conscientious parents and youthful fantasies as it works hard to transform every child into a lifetime consumer of Disney products and ideas. Put the Disney corporation under scrutiny, however, and a contradiction quickly appears between a Disney culture that presents itself as the paragon of virtue and childlike innocence and the reality of the company's cutthroat commercial ethos. Disney, like many corporations, trades in sound bites; the result is that the choices, exclusions and values that inform its narratives about joy, pleasure, living and survival in a global world are often difficult to discern. Disney needs to be addressed within a widening circle of awareness, so we can place the history, meaning and influence of the Disney empire outside of its own narrow interpretive frameworks that often shut down critical assessments of how Disney is actually engaged in the commercial carpet bombing of children and teens. Understanding Disney in the year 2010 requires that we draw attention to the too often hidden or forgotten corporate dimension surrounding the production, distribution and consumption of Disney culture and, in so doing, equip parents, youth, educators, and others with tools that will enable them to critically mediate the ways in which they encounter Disney. In 1999, Disney was a $22 billion profit-making machine. Ten years later, Disney is generating over $37.8 billion per year and quickly expanding the market for its products in countries such as China, where the latest Disney theme park - Hong Kong Disneyland - opened in 2005, and another park is slated for development in Shanghai. Now a worldwide distributor of a particular kind of cultural politics, Disney is a teaching machine that not only exerts influence over young people in the United States, but also wages an aggressive campaign to peddle its political and cultural influence overseas. As global capital spreads its influence virtually unchecked by national governments and the international community, citizenship becomes increasingly privatized and youth are educated to become consuming subjects rather than civic-minded and critical citizens. If today's young people are to look ahead to a more rather than less democratic future, it has become imperative for people everywhere to develop a critical language in which notions of the public good, public issues and public life become central to overcoming the privatizing and depoliticizing language of the market. One measure of the corporate assault on kids can be seen in the reach, acceleration and effectiveness of Disney's marketing and advertising efforts to turn kids into consumers and childhood into a salable commodity. Every child, regardless of how young, is now a potential consumer ripe for being commodified and immersed in a commercial culture defined by brands. The Walt Disney Company spares little expense in generating a coherent brand image and encapsulating its many products and services within the seductive symbolism of childhood innocence and wholesome family fun. The company's approach makes Disney a particularly useful case for understanding corporate strategies directed at youth in the new media environment. At the same time as Disney represents nostalgia and tradition, it has become a global leader in transforming digital technologies into profit-making platforms and developing a consumer-centered discourse that deflects criticism away from, while it softens, what can only be called boldly commercial self-promotion. 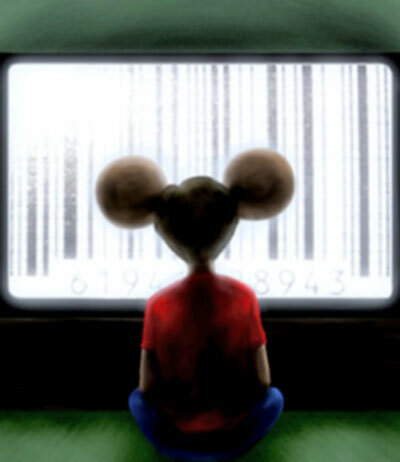 Disney, with its legion of media holdings, armies of marketers and omnipresent advertisers sets out not just to exploit children and youth for profit: it actually constructs them as commodities while promoting the very concept of childhood as a salable commodity. Childhood ideals increasingly give way to a market-driven politics in which young people are prepared for a life of objectification that will simultaneously drain them of any viable sense of moral and political agency. This is especially true in the current consumer society in which children more than ever mediate their identities and relations to others through the consumption of goods and images. No longer imagined within the language of responsibility and justice, childhood begins with what might be called the scandalous philosophy of money, that is, a corporate logic in which everything, including the worth of young people, is measured through the potentially barbaric calculations of finance, exchange value and profitability. Disney, perhaps more than any other corporation, has created a marketing powerhouse that uses the pivotal educational force of children's culture in combination with new digital media technologies. Kids can download enormous amounts of media in seconds and carry around such information, images and videos in a device the size of a thin cigarette lighter. "[media] technologies themselves are morphing and merging, forming an ever-expanding presence throughout our daily environment." "to include video game platforms, e-mail devices, digital cameras and Internet connections," making it easier for marketers and advertisers to reach young people. "a new 'marketing ecosystem' that encompasses cell phones, mobile music devices, broadband video, instant messaging, video games and virtual three-dimensional worlds," all of which provide the knowledge and information that young people use to navigate their place in families, schools and communities. Disney along with its researchers, marketing departments and purveyors of commerce largely define and control this massive virtual entertainment complex, spending vast amounts of time trying to understand the needs, desires, tastes, preferences, social relations and networks that characterize youth as a potential market. The disconnect between market values and the ethical responsibility to care for children is on full display in Disney's almost boastful use of research to mine the inner lives and experiences of young children. That Disney's insidious strategies receive front page coverage in The New York Times and are presented without so much as a critical comment is a testament to how commercial values have numbed the public's ability to recognize the danger such values often present to children. According to The New York Times, Disney is at the forefront of finding ways to capitalize on the $50 billion dollars spent worldwide by young boys between the ages of six and 14. As part of such an effort, Disney seeks the advice of educators, anthropologists and even a research consultant with "a background in the casino industry," not only to study all aspects of the culture and intimate lives of young boys, but to do so in a way that allows Disney to produce "emotional hooks" that lure young boys into the wonderful world of corporate Disney in order to turn them into enthusiastic consumers. Disney's recent attempts to "figure out the boys' entertainment market" enlisted the services of Kelly Pena, described as "the kid whisperer," who attempts to uncover what makes young boys tick by using her anthropological skills to convince young boys and their parents to allow her to look into the kids' closets, go shopping with them and pay them $75 to be interviewed. Ms. Pena, with no irony intended, prides herself on the fact that "Children... open up to her." Given Disney's desire to expand into boys' culture, the company's announcement in 2009 that it had purchased Marvel Entertainment Inc. came as no surprise. Marvel's comic book empire owns the licenses to approximately 5,000 superhero characters. It is even more disturbing that Disney and a growing number of marketers and advertisers now work with child psychologists and other experts, who study young people in order to better understand children's culture so as to develop marketing methods that are more camouflaged, seductive and successful. "You have to start with the kids themselves." Several psychologists, especially Allen D. Kanner, have publicly criticized such disingenuous practices. Disney's recent attempt to corner the young male market through the use of sophisticated research models, ethnographic tools and the expertise of academics indicates the degree to which the language of the market has disengaged itself from either moral considerations or the social good. It is clear that Disney's only goal is to win over the hearts and minds of young people so as to deliver them to the market as both loyal consumers and commodities. In such unscrupulous strategies, the contradiction becomes visible between Disney's public relations image as a purveyor of wholesome entertainment and the hidden reality of Disney as a political and economic power that promotes ideology conducive to its own corporate interests, thereby impoverishing the imaginative possibilities of youth and dismantling the public foundations for a thriving civic culture. Corporate culture is rewriting the nature of children's culture, a trend that becomes visible in the various ways traditional boundaries once maintained between the spheres of formal education and entertainment are collapsed. Capitalism targets kids as soon as they are old enough to watch commercials, even though they may not be old enough to distinguish programming from commercials or to recognize the effects of branding and product placement. In fact, researchers have found that while children as young as three years old recognize brand logos, not until they are around eight years old do they understand advertising's intention to manipulate their desires. But this has not stopped corporations from exposing kids from birth to adulthood to a consumer blitz of advertising, marketing, education and entertainment that has no historical precedent. There is now even a market for videos for toddlers and infants as young as three months old. Not surprisingly, this is part of a growing $4.8 billion market aimed at the youngest children - an area of multimedia culture into which Disney recently expanded. In 2000, Disney purchased the Baby Einstein Company from its founder, Julie Aigner-Clark, who had created a line of products and toys known to mesmerize these youngest television watchers by displaying, for example, vibrant moving objects while playing a soundtrack of classical music selections. The marketing of the products suggests that parents can purchase toys and videos that will not only enable their children to develop good taste in music, but also make them capable of great intellectual achievements. Despite objections against the marketing of baby videos as educational media by organizations such as the Campaign for a Commercial-Free Childhood, Disney persists in using clever packaging for the videos that implies they are, at best, beneficial learning tools to be used in a child's most formative years and, at worst, harmless distractions for infant audiences. And the marketing strategy works. "a positive effect on early childhood development." The news that baby DVDs and videos actually impair infants' cognitive development broke in 2007 when the University of Washington issued a press release about a study published in the prestigious Journal of Pediatrics that concluded infants eight to 16 months old, who were exposed to one hour of viewing baby DVDs and videos per day, displayed slower language development: those children understood on average six to eight fewer words for every hour of viewing than infants who did not watch the videos. Reading to a child once a day, by contrast, produced an observable increase in vocabulary. How did Disney respond to the researchers' findings? Disney's main objection was that the study did not differentiate between brands when it tested the effects of baby videos on language development. "research aimed at helping parents and society enhance the lives of children." While this research was clearly not enough to deter Disney from marketing its Baby Einstein wares as beneficial for babies and toddlers, other researchers have found that one of greatest costs associated with surrounding very young children with screen media is a reduction in the time they spend engaging in creative, unstructured play. "time for free play has been markedly reduced for some children." Yet Disney's message to parents continues to foster the idea that parents should not only accept the ubiquitous presence screen culture in their babies' lives, but view it as an inevitable fact of life, one pointless to criticize and impossible to change. "in a typical day, 68% of all children under two use screen media." This statistic is not presented as something that should alarm concerned parents and encourage different parenting practices; on the contrary, it becomes simple proof of "the reality of today's parents, families and households" and an indicator of how the American Academy of Pediatrics, which discourages television viewing for children under two years old, is simply stuck in the past. Disney's marketing tactics utilize the idea that parents who want their kids to keep up in a highly competitive world must supply them with every available product that purports to nurture young minds. "in a manner that is compelling, comprehensive, entertaining and, most importantly, objective." The web site taps into the growing parenting industry, claiming to target "the more than 32 million moms that are online in the US." Given Disney's attempt to refute work by leading researchers in children's health, it is unclear what the web site intends to publish as "articles from experts in the parenting field." But if the so-called expertise is not useful to parents, they can at least download a coupon from the "Family Tool Box." The web site also features the "Disney Family Learning Center," developed in collaboration with Sony Electronics and Powered, Inc., an online education provider that also happens to specialize in social marketing. Disney finds ways to promote Sony's and its own products when advising parents on child development, entertainment options and other "family-relevant information" in its online courses, such as "Traveling Light with Kids and Technology" and "Contact Management for the Busy Mom and Dad." "There is massive opportunity here." "clear leadership in the kids and families online virtual worlds space around the globe." Disney views online media as an opportunity not so much to enhance children's lives as to make money for shareholders, enjoy low overhead costs and keep the company's film and television franchises profitable. The Disney.com site, redesigned in 2007, includes video games, social networking, customized user content and videos on demand. As of the summer of 2009, approximately 16 million users have designed customized fairy avatars that inhabit Pixie Hollow at DisneyFairies.com. Internet sites offering cooperative games and social networking to children seem like a relatively innocuous option in a media culture currently exploiting every imaginable angle to populate reality television's competitive worlds of winners and losers. It is far less innocuous, however, that these web sites help Disney collect and use personal information to assail consumer groups with targeted, cross-promotional advertising. Web-based social media not only acculturate children to being constantly bombarded with advertising, but give them the illusion of control while they are actually being manipulated. Disney's interest in capturing the attention of very young people through the Internet has also involved the acquisition of Club Penguin, a web-based virtual world, in a $700 million deal in 2007. Disney's Club Penguin targets kids ages six to fourteen and provides each user with an animated penguin avatar that interacts in a snow-covered world, chats with other users and earns virtual money to purchase items such as pets, clothing and furnishings for an igloo home. Users can play for free, but must pay $5.95 per month for access to certain features of the game. As an interactive and "immersive environment," Club Penguin enables Disney to train children in the habits of consumption - merchandise, such as stuffed penguins, is advertised on the site - while making direct contact with its global consumer base through the online network. Similarly, Disney's "Pirates of the Caribbean," for children under ten years of age, lures kids into a virtual world of consumers that is predicted to include 20 million children by 2011. As Brooks Barnes points out in The New York Times, these electronic malls are only superficially envisioned by developers as entertainment or educational sites. "deliver quick growth, help keep movie franchises alive and instill brand loyalty in a generation of new customers." In order to tap further into the youth market, Disney's recent strategy has involved spending $180 million on video game development. Disney-branded online space includes the Internet's first multiplayer game for kids, "Toontown Online." "construct entire cultural experiences based around beloved characters, fantasy and play [but] entry into these worlds is only possible through a perpetual cycle of consumption." Another product, the video game "Epic Mickey," revamps the character of Mickey Mouse in an alleged effort to make him more appealing to today's generation of youth. The mouse will no longer embody a childlike innocence and generosity, but will instead be "cantankerous and cunning" and will exhibit "selfish, destructive behavior." With Mickey's popularity in decline in the United States, Disney's market-driven agenda is visible not only in its willingness to transform the hallowed icon upon which its corporate empire was built, but also in the very way it has transformed Mickey Mouse's character. Although Disney's representatives suggest that this reimagining of Mickey Mouse merely reflects what is currently popular among young people, it seems more aligned with the current ideology of a ruthless economic Darwinism (also evident in reality TV shows) that has little to do with the needs of children and a great deal to do with a survival-of-the-fittest view of the world perpetuated by market-centered culture. The recent moves by the Walt Disney Company to darken the characters it incorporates into its cultural offerings should be seen as less a demystification of the brand image of Disneyfied innocence and more a signal of the company's desire for a growing compatibility between its public pedagogy and a commercial culture's ethos of egocentric narcissism, social aggression and hypermasculinity. The issues surrounding Disney culture as a source of identity for young people are complex. "changing one's ego" through "an unending series of self-focused pursuits, each episode lived through as an overture to the next." Whether or not this is a dramatic departure from the way life was lived in the past, it is nevertheless becoming clear that today's youth also are now caught up in negotiating shifting identities through processes that involve a constant engagement with educational sites throughout the culture. How much more challenging, then, will young people who are just embarking on the process of identity development find the navigation of a commercialized culture that appears to offer limitless choice in terms of selfhood, yet, effectively limits the choices that both children and adults can make in extending their sense of personal and collective agency? One sign of how the Walt Disney Company seeks to intervene in children's lives by shaping their identity narratives was evident in the company's 2009 announcement that it would be redesigning its chain of 340 Disney Stores to mirror a theme park design. Based on the prototype called Imagination Park, the renovated stores will be entirely networked with interactive technology to create a multisensory recreational experience that encourages consumer participation and emphasizes community through collective activities. The Disney store refurbishment project's "goal is to make children clamor to visit the stores and stay longer" and will cost approximately $1 million per store. By enabling visitors to generate a narrative for their own consumption, the stores will offer the illusion that kids are the producers of meaning and have the capacity to customize their identities through the stories that are created around Disney products and places. Such power is not necessarily false and it is undoubtedly seductive in a world of narrowing opportunities for agency and expression - perhaps even more so for children and youth for whom such opportunities are few and for whom the spectacular has not yet lost the appeal of novelty. At the same time, it confines the imagination and any corresponding sense of community to the narratives on offer, which ultimately all lead back to immersing the individual in fun, conflict-free processes of consumption designed to generate corporate profits. It is astounding the ease with which Disney's conventional fantasy formula for young adults - recently updated and reissued in films like "High School Musical" - reduces unpleasant and contradictory lived experiences to the "trials and tribulations" of well-off kids who "just want to fit in," and can easily do so by participating in consumer culture. "uniform in its middle-American, asexual, uninflected sameness," all of which works to embody a "sense of classless luxury and unthreatening sameness... a synthetic spirit of democracy" that promises a kind of belonging free from the "stress of competition." The Disney celebrity factory has long been masterful at churning out clean-cut teen idols who symbolize these wholesomely bland American values. Miley Cyrus (aka Hannah Montana) is one of the latest incarnations of Disney's star-making power. "parents unnerved by the spectacle of the Spears family," Miley Cyrus represents a positive role model for "millions of girls still figuring out how they feel about boys." Cyrus plays the character Miley Stewart in the Disney TV show "Hannah Montana" alongside her real-life father, country singer Billy Ray Cyrus. The show focuses on the story of a teenage girl, who wants to lead a totally normal life at home and school and, therefore, decides to keep it a secret that she is also the superstar pop singer Hannah Montana. She achieves this goal by changing her clothing and hair color. On the show, then, the lead character, Miley Stewart, has a rock-star altar ego named Hannah Montana and, in real life, Disney aggressively markets Miley Cyrus as a pop icon by producing her music CDs and funding a 2007 concert tour, called Hannah Montana/Miley Cyrus: Best of Both Worlds. As one reporter for The New York Times commented, Disney's public relations' ingenuity ensures that consumers get "three girls for the price of one." It seems that in a world increasingly defined by fragmentation and instability, "Hannah Montana" taps into the fantasy of celebrity, offering young people the lure of agency through an endless reinvention of the self. A tween girl might identify with the family dynamics depicted on the show, but need not stop there when she can also transform herself among her classmates and achieve the chic look of a rock starlet merely by purchasing "Hannah Montana" clothing at Wal-Mart. According to the Disney formula, self-expression is once again reduced to what a young person can afford to buy. And Disney is expert at reinforcing such cycles of brand promotion by generating relationships between its media offerings and consumer products. "highly developed corporate synergy in which every Disney product is both a commodity and an ad for every other Disney commodity." The comment from The New York Times about Cyrus being a good role model for kids should be considered within this context of consumerism and what it teaches young girls in terms of their identities, values and aspirations. Hannah Montana is not a superhero, but merely a superstar whose only responsibility in life is to entertain her fans and make money. Miley Stewart's raison d'être is to deceive the people around her so that she can live her life unencumbered by the social responsibilities attendant on being a well-known public figure. Finally, does not Cyrus, as the real life embodiment of "three girls for the price of one," represent the most commodified of role models, severely and insidiously proscribing the imaginative possibilities for a generation of young women who are sadly being encouraged to view their bodies as objects, their identities as things to be bought and sold and their emotional and psychological health as best nurtured through "retail therapy" (shopping)? "growing interpenetration of the economic and the cultural." Spaces that were once constructed through "forms of public culture," as noted by Sharon Zukin, have now become privatized, controlled and framed by corporate culture. These spaces, from suburban shopping malls to tourist spots to city centers, encourage leisure while also "priming the young for consumerism." While colonizing multiple cultural spaces, corporations like Disney are increasingly looking to virtual space in order to provide "enhanced" experiences for a consumer class that wants to maximize its leisure time. "production of subjectivity that is not fixed in identity, but hybrid and modulating." Paradoxically, though, Disney gains access to children and adults by selling the illusion of fixity. In other words, Disney culture acts as a temporary salve to growing feelings of uncertainty and insecurity produced by economic dislocations and social instability on a national and global scale. It is no small irony that, while offering people the "swindle of fulfillment" promised by rampant consumerism, multinational corporations such as Disney are one of the globalizing forces largely responsible for the instabilities and upheavals facing contemporary nation states. Indeed, the sovereignty of national governments is increasingly challenged by the power of multinational corporations and the logic of the marketplace they embody; governments are downsized and their services are privatized or gutted, corporations receive incentives in the form of huge tax breaks or bailouts with taxpayers' money, legislation is passed that further deregulates the market and democratically elected governments fail in their responsibilities to foster a just and equal society. Given these conditions, it is no wonder that individuals find comfort in the stable meanings they can ascribe to Disney and turn to consumption for even the semblance of personal agency. Multinational corporations such as Disney have become "the aristocratic articulations" of a global monopoly of power and coercion that is imposed from above and that achieves control through circuits that do not reveal themselves because they operate on the "terrain of the production and regulation of subjectivity" itself  - that is, in the realm of cultural production and consumption. "The market does not simply obliterate all earlier traditions. It is opportunistic. It will enhance and concentrate on those features of a society which turn a profit or change them in such a way that they will make money." Consequently, everything potentially becomes a commodity, including and perhaps most especially, identity. Global capitalism manages and controls diversity by commodifying and selling different identity positions, while also encouraging self-commodification - particularly of youth - through various marketing trends and technologies that become increasingly ubiquitous in the lives of the adults, teens and the very youngest children alike. Children are not born with consumer habits. Their identities have to be actively directed to assume the role of consumer. If Disney had its way, kids' culture would become not merely a new market for the accumulation of capital, but a petri dish for producing new commodified subjects. "to expand 'inwardly' into the psyche and emotional life of the individual in order to utilize human potential" in the service of a market society. Virtually every child is now vulnerable to the many advertisers and entertainment providers who diversify markets through various niches, most recently evident in the use of mobile technologies and online social media. Complicit, wittingly or unwittingly, with a global politics defined by market power, the American public offers little resistance to children's culture being expropriated and colonized by large multimedia conglomerates and Madison Avenue advertisers. Eager to enthrall kids with invented fears and lacks, corporate media culture also entices them with equally unimagined new desires, to prod them into spending money or to influence their parents to spend it in order to fill corporate coffers. The potential for lucrative profits to be made off the spending habits and economic influence of kids has certainly not been lost on Disney and a number of other multinational corporations, which under the deregulated, privatized, no-holds-barred world of the free market have set out to embed the dynamics of commerce, exchange value and commercial transactions into every aspect of personal and daily life. Wrapping itself up in the discourse of innocence and family-oriented amusement in order to camouflage the mechanisms and deployment of corporate power, Disney uses its various entertainment platforms that cut across all forms of traditional and new media in a relentless search for young customers to incessantly bombard with a pedagogy of commerce. In the broader society, as the culture of the market displaces civic culture, children are no longer prioritized as an important social investment or viewed as a central marker for the moral life of the nation. Instead, childhood ideals linked to the protection and well-being of youth are transformed - decoupled from the "call to conscience [and] civic engagement" - and redefined through what amounts to a culture of excessive individualism and the numbing of public consciousness. Rather than participate mindlessly in the Disneyfication of culture, we all need to excavate the excluded memories and silenced voices that could challenge the uncomplicated commodified identities offered to young people by Disney in the name of the innocence and entertainment. As one of the most influential corporations in the world, Disney does more than provide entertainment: it also shapes in very powerful ways how young people understand themselves, relate to others and experience the larger society. It is not difficult to recognize tragedy in the fact that a combination of entrenched social inequality and a lack of resources means that kids disappear literally into foster care institutions, teachers are overwhelmed in overcrowded classrooms and state services are drained of funds and cannot provide basic food and shelter to growing numbers of kids and their families. Yet, corporations such as Disney have ample funds to hire a battalion of highly educated and specialized experts to infiltrate the most intimate spaces of children and family life - all the better to colonize the fears, aspirations and futures of young people. Disney's commodification of childhood is neither innocent nor simply a function of entertainment. The values Disney produces as it attempts to commandeer children's desires and hopes may offer us one of the most important clues about the changing nature of our society and the destructive force behind the unchecked economic power wielded by massive corporations. Strategies for challenging the corporate power and the consumer culture Disney propagates in the United States and increasingly across the rest of the globe must be aligned with a vision of a democracy that is on the side of children and youth. It must enable the conditions for young people to learn and develop as engaged social actors more alive to their responsibility to future generations than those adults who have presently turned away from the challenge. 1. Lizabeth Cohen, "A Consumer's Republic: The Politics of Mass Consumption in Postwar America," (New York: Vintage, 2003). 2. Lawrence Grossberg, "Caught in the Crossfire: Kids, Politics and America's Future," (Boulder: Paradigm Publishers, 2005), p. 264. 3. Press release on Multiplatform Video Report by Solutions Research Group, "Daily Hours Watching Video and TV to Match Sleep by 2013," Solutions Research Group, June 11, 2008. 4. Cited in Don Hazen and Julie Winokur, eds. "We the Media, "(New York: New Press, 1997), p. 64. 5. Robert Bryce, "Click and Sell," University of Texas at Austin News, August 15 - 22, 2005. 6. Susan Linn, :Consuming Kids: The Hostile Takeover of Childhood," (New York: New Press, 2004), p. 8. 7. Alex Molnar and Faith Boninger, "Adrift: Schools in a Total Marketing Environment," Tenth Annual Report on Schoolhouse Commercialism Trends: 2006-2007 (Tempe: Arizona State University, 2007), pp. 6-7. 8. Anup Shah, "Children as Consumers," Global Issues (January 8, 2008). 9. See Josh Golin, "Nation's Strongest School Commercialism Bill Advances Out of Committee," Common Dreams Progressive Newswire (August 1, 2007). 10. Victoria Rideout, Donald F. Roberts and Ulla G. Foehr, "Generation M: Media in the Lives of 8-18 Year-Olds," (Washington, D. C.: The Kaiser Family Foundation, March 2005), pp. 6, 9. 11. Rideout, Roberts and Foehr, "Generation M," p. 4. 12. Juliet B. Schor, "Born to Buy: The Commercialized Child and the New Consumer Culture," (New York: Scribner, 2004), p. 9. 13. For a list of the Walt Disney Company's vast holdings, see Columbia Journalism Review, "Who Owns What," April 14, 2009. 14. Jack Lyne, "Hong Kong Disneyland Tops Out Centerpiece Structure," The Site Selection Online Insider, October 10, 2004. 15. Henry A. Giroux, "The Mouse That Roared: Disney and the End of Innocence," (Lanham: Rowman & Littlefield, 1999), p. 26. 17. Rideout, Roberts and Foehr, Generation M, p. 4. 20. Brooks Barnes, "Disney Expert Uses Science to Draw Boy Viewers," New York Times (April 14, 2009), A1. 23. Ethan Smith and Lauren A.E. Schuker, "Disney Nabs Marvel Heroes," Wall Street Journal, September 1, 2009, A1. 24. Barnes, "Disney Expert," A14. 25. Allen D. Kanner and some of his colleagues raised the ethical issues with child psychologists helping marketers in a letter to the American Psychological Association. See Miriam H. Zoll, "Psychologists Challenge Ethics of Marketing to Children," American News Service (April 5, 2000). See also Allen D. Kanner, "The Corporatized Child," California Psychologist 39.1 (January/February 2006), pp. 1-2; and Allen D. Kanner, "Globalization and the Commercialization of Childhood," Tikkun 20:5 (September/October, 2005), pp. 49-51. Kanner's articles are online. 26. Grossberg, "Caught in the Crossfire," p. 88. 27. Paul M. Fischer et al., "Brand Logo Recognition by Children Aged 3 to 6 Years: Mickey Mouse and Old Joe the Camel," Journal of the American Medical Association 266, no. 22 (1991), pp. 3145-3148; American Psychological Association news release, "Television Advertising Leads to Unhealthy Habits in Children, Says APA Task Force," APA Online, February 23, 2004. 28. Molnar and Boninger, "Adrift," p. 9. 29. Victoria Rideout, "Parents, Children and Media: A Kaiser Family Foundation Survey," Kaiser Family Foundation, June 2007, 7. 30. Joel Schwarz, "Baby DVDs, Videos May Hinder, Not Help, Infants' Language Development," University of Washington News, August 7, 2007. 31. See Frederick J. Zimmerman, Dimitri A. Christakis and Andrew N. Meltzoff, "Associations between Media Viewing and Language Development in Children under Age 2 Years," Journal of Pediatrics 151, no. 4 (October 2007), pp. 364-68. 32. A transcript of this letter from Robert A. Iger to Mark A. Emmert, president of the University of Washington, dated August 13, 2007, is available online. See Meg Marco, "Walt Disney Demands Retraction from University of Washington over Baby Einstein Video Press Release," The Consumerist, August 13, 2007. 33. Letter from Mark A. Emmert to Robert Iger, dated August 16, 2007, is available online. See Joel Schwarz, "UW President Rejects Disney Complaints," University of Washington News, August 16, 2007. 34. Kenneth R. Ginsburg, "The Importance of Play in Promoting Healthy Child Development and Maintaining Strong Parent-Child Bonds," Pediatrics 119, no. 1 (January 2007), 183. Available online. Additional factors affecting this loss of time include (1) pressure on parents "to produce superachieving children," which leads them to overschedule their kids' time in structured, "enrichment" activities; and (2) the restructuring of public schools to focus on academic study, which has led to decreased time for recess periods, physical education and creative-arts programming. 35. For an excellent critique of how parental fears are mobilized as part of a larger effort to professionalize parenting, see Frank Furedi, "Paranoid Parenting," 2nd ed., (New York: Continuum, 2008). 36. Victoria J. Rideout, Elizabeth A. Vandewater and Ellen A. Wartella, "Zero to Six: Electronic Media in the Lives of Infants, Toddlers and Preschoolers," Kaiser Family Foundation, Fall 2003, 5. Available online. 37. "About Baby Einstein," Disney Baby Einstein web site. 38. Powered press release, "Disney Family.com and Sony Electronics Launch Virtual Classroom for Moms," RedOrbit, May 16, 2007. 39. Disney news release, "Disney Creates One-Stop Online Resource for Parents," Walt Disney Interactive Media Group Newsroom, March 13, 2007. 40. Powered press release, "Disney Family.com." 41. Brooks Barnes, "Web Playgrounds of the Very Young," New York Times, December 31, 2007. 42. Disney news release, "The Walt Disney Company Acquires Club Penguin," Disney News Releases, August 1, 2007. 43. Disney news release, "Disney Interactive Studios Announces Disney Fairies: Tinker Bell and the Lost Treasure for Nintendo DS," Financial Post, June 2, 2009. 44. Cited in Barnes, "Web Playgrounds." 46. Sara M. Grimes, "Saturday Morning Cartoons Go MMOG," Media International Australia 126 (February 2008): 120 - 31. Available online. 47. Brooks Barnes, "After Mickey's Makeover, Less Mr. Nice Guy," New York Times, (November 5, 2009). 48. Zygmunt Bauman, "Liquid Times: Living in an Age of Uncertainty (London: Polity, 2007), 107, 109. 49. Brooks Barnes, "Disney's Retail Plan Is a Theme Park in Its Stores," New York Times, (October 13, 2009). 50. Elayne Rapping, "A Bad Ride at Disney World," The Progressive, November 1995. 51. Kelefa Sanneh, "3 Girls for the Price of One (if You Could Get a Ticket)," New York Times, December 31, 2007. 53. Mike Budd, "Introduction: Private Disney, Public Disney," in "Rethinking Disney: Private Control, Public Dimensions," ed. Mike Budd and Max H. Kirsch (Middletown, Connecticut: Wesleyan University Press, 2005), p. 1. 54. Alan Bryman, "The Disneyization of Society," (London: Sage, 2004), 173. 55. Sharon Zukin, "Learning from Disney World," The Cultures of Cities, (Malden, Massachusetts: Blackwell, 1995), p. 77. 56. Bryman, "The Disneyization of Society," p. 169. 57. Michael Hardt and Antonio Negri, "Empire," (Cambridge, Massachusetts: Harvard University Press, 2000), p. 331. 58. Jack Lyne, "Hong Kong Disneyland Tops Out Centerpiece Structure," The Site Selection Online Insider, October 10, 2004. 59. Ernest Bloch, cited in Anson Rabinach, "Unclaimed Heritage: Ernst Bloch's Heritage of Our Times and the Theory of Fascism," New German Critique (Spring 1977), p. 8. 60. Hardt and Negri, "Empire," pp. 314, 321. 61. Jeremy Seabrook, "Racketeers of Illusion," New Internationalist 308, (December 1998). 62. Jeff Chester and Kathryn Montgomery, "No Escape: Marketing to Kids in the Digital Age," Multinational Monitor 30, No. 1 (July/August 2008). 63. Rutherford, "Cultures of Capitalism." 64. Kiku Adatto, "Selling Out Childhood," Hedgehog Review 5: 2 (Summer 2003), p. 40. "Disney, Militarization and The National Security State After 9/11"
"One of The Greatest Deceptions of All Time - Disney"